You are here: Home / Web design & development / What you should know about your domain name and website hosting. This article is for people looking to get a domain name for their personal or business website for the first time, or for owners that are not aware if they own or not their website domain name and hosting. Many of my clients when I first met them had the misfortune of dealing with an individual or company that created a website for them and in the process, basically took over their company name without their knowledge. They don’t have ownership for their website name and hosting which poses a few problems as you might imagine. Think of this situation as buying a property, thinking it’s yours but only to find out that the realtor registered everything under their name without your knowledge. You are making the monthly payments but when you want to sell, move or do anything else with it, you find that the company or person won’t let you because they have the control over it. So right about now is the time to act if you think that you are in that situation. Depending on your current relationship with the development/design company that built the website, you might get your name and hosting transferred to you without any problems, or they simply keep ownership and if you want the rights back, you end up paying an over inflated price in some cases, or they simply put the name up for bids with a third party company. Sometimes the easy and stress-free way of dealing with that, is to simply register a domain that is close to the original or something that improves from the first one. There is always a solution to any problem. Lets see how you can simply take the steps necessary when first talking to any designer/developer when building your brand new website, to make sure that you have control of both the name and hosting to begin with. Also it’s important to note, that if you currently have a website, it’s never too late to find out if it’s under your name, or review the contract in case there is a clause that says something about the domain name and hosting that you might not know of. If you feel comfortable going through the registration process go ahead and do it yourself. In case you need help, don’t be afraid to ask for it, any reputable company or individual will assist you. If the company or designer tells you that they will do it for you, politely request that you would like to do it yourself (not all companies or individuals offering to get this done for you are bad, if you trust them fully is your call), this might not be a red flag but it might be a way for them to keep you around under their terms. Or if the company or designer tells you that they will do it for you, tell them that you would like to be involved, and use your personal credit card. This will not offend them and you get your domain and hosting under your name. Finally if you think you own your domain name, if won’t hurt to check. Websites like whois.net can assist. Just head to their site, and under the “WHOIS Lookup” field enter your website name only, without the .com .org etc and click go, a new page will open with the information of the owner, technical contact, emails, when it was first registered, and most importantly registered by who. Use the Whois Lookup field to check domain name registration information. 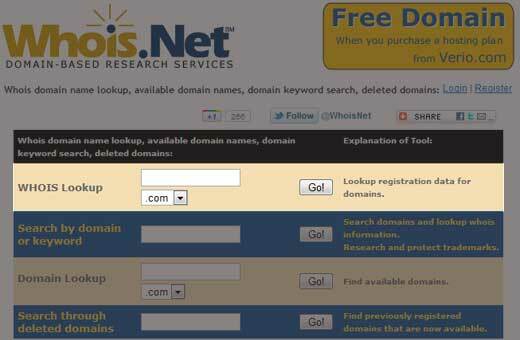 The website name registration process is done via a domain name registrar like godaddy.com, register.com and others. For example, if your company name is Awesome Flowers, you will have to go to a registrar, pay a registration fee that costs between US$10 to US$35 for the name awesomeflowers.com so you can own that name, if it’s still available. Now that you own the right to that name for a year, or more depending for how long you registered the name for, you are all set. A side note here, if the only thing that you want to do at the moment is to buy the name, make sure you read everything carefully on the domain registrar site. Many times they will try to bundle a service or product that you don’t need, if you have questions ask the person building your site for their advice. If later on you need to add other services or products, you can always do it. But if you click and accepted their terms on your first transaction, it might be hard to take those extra fees/services away. What is the hosting for my website? The next step is to buy your website space with a hosting company. Basically your website needs a place to store your images, files, text, etc. in a computer that is secure, always on and capable of running the software necessary to let your website visitors enter your website. Before buying the space, you should speak again with your designer/developer and see if they have any preferences or recommendations. Some hosts again offer things that you might need or not, also some designers favor Linux servers others Windows servers, so ask what they recommend for your project. Also many designers/developers might offer to give you space on their server, which opens other potential problems. If their hosting service is interrupted on their account for any reason, your website will go down. They might decide to ask for extra money for the space they are giving you. In the end it could cost you much less if you got the service yourself. A positive side of having them control the hosting could be that you decided that you didn’t wanted to deal with the technical aspects of your website. But keep in mind that hosting companies offer a wealth of knowledge, plus they are very supportive and helpful with non technical users. Last but not least the longer the period that you buy the website hosting and domain name for, the more discounts you will score. In conclusion do your homework when buying your domain name and hosting. And make sure to ask as many questions as needed before signing anything, to make sure that you don’t have to go through any problems later on.